A. Wear a hair-net to help your helmet last longer. B. Make sure that you also wear sunglasses for additional protection. C. Ensure that you always wear motorcycle specific clothing. Correct. Motorcycle-specific clothing will be comfortable, but not loose, will keep you warm and dry, and will provide extra protection in the event of a crash. Tarmac will shred your skin in a fraction of a second if you slide along it at speed. We've all had grazed knees and elbows from coming off a pushbike at only a few kilometres per hour. Now imagine it at 100kph. Therefore we wear protective clothing or personal protective equipment (PPE). The main functions of PPE are to improve visibility, resist abrasion, protect against impacts and protect against the weather. Anyone riding a motorbike without long-sleeved trousers and a jacket, gloves and boots is asking for serious injuries, possibly requiring skin grafts. There are also other protective measures you can take. Let's take a look at the main protective equipment you can buy for your body. Check out what sort of helmets you can buy in our guide here. Leather is the traditional material for jackets as it's durable and resists abrasion well. Modern fabrics provide as much protection and waterproofing while remaining breathable. Windproofing and waterproofing will help protect you from hypothermia when riding in cooler climates where the wind chill can make the temperature much colder. If your jacket doesn't have a collar then you may need a good scarf or some kind of windproof balaclava. A velcro closure on the cuffs makes it less likely that any abrading force like tarmac will make the sleeves rise up your arms, exposing bare skin. Similarly, some jackets will have heavy duty zips to attach the back to your pants and this prevents the jacket from riding up which can expose skin in a crash. Jackets are sometimes available with removable thermal liners. A jacket could also have built-in spine protection. 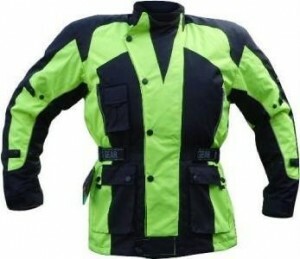 An ideal jacket is one with reflective panels or piping to improve your visibility. Or you can wear a high-visibility vest over the top. Many jackets will be fireproof, too. 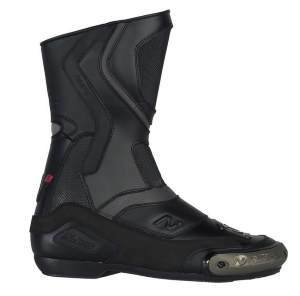 Boots should cover the ankle and preferably have moulded shin protection. If you come off your bike, the shin protection will help prevent injuries if your shins hit the handle bars. 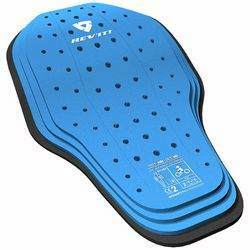 It's preferably to have solid ankles to prevent your ankle from being hyperextended if you have an accident, but this will make them more difficult to walk in. The boots should be waterproof and breathable. They must be a good fit because you will be operating your brake and gears with them. Ankle protection is usually included. Pay attention to the sole. It should provide arch support. It is good if it contains some kind of anti-crush shank (e.g. steel). Check that you can take the boots off and put them on easily. Reflective areas are desirable to help with visibility, especially on the heel and side. 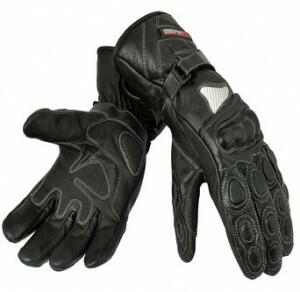 Gloves will help keep your hands warm as well as protecting them if you have an accident. They will likely have knuckle protection and should have a wrist strap that you can tighten to keep them on your hands. It's important that they are breathable otherwise your hands will be sweaty and uncomfortable. Choose a fabric that repels water and dirt. Gloves come in various materials including leather and synthetic fabrics with rubber, Kevlar, polyurethane and other products used for padding and impact protection. The palm of the glove should not become slippery when wet or you will have less control over your bike. Some gloves will have a visor wipe strip on one of the fingers. Reflective piping or panels helps keep you more visible at night. Pants should have some armouring and be windproof and waterproof. They need to be big enough to fit over your boots. Many pants will have a zip at the back to attach to your jacket. If you already have a jacket check before you buy that the zips are compatible. Padding on the hips is important in a crash. If they have built-in knee pads then you won't need external knee pads. 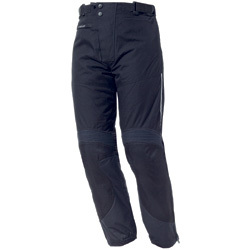 The pants should come with zipper pockets and reflective panels or piping to improve your visibility at night. When you try them on make sure to crouch down to see if they are long enough and are comfortable in the crotch; your riding might include long periods with bent legs and you don't want the pants to ride up too high. If you are going to wear them over other pants, like jeans, make sure to go one size up. Look at the overall weight if this is important to you. Some riders don't like really heavy pants. Apart from your head, your spine is the most important part of your body to protect. Back armour, if it's not built into your jacket, can be worn under your jacket and will provide cushioning to your spine and kidney area. If your jacket doesn't have pockets then you will need to get armour that comes with shoulder straps. This is not a product to scrimp on - get the best one you can. They will often come in different sizes for different sized riders. Some will protect all the way down your spine while others just protect the upper spine and shoulders. Good ear plugs should reduce sound volume by 25-30dB, and this is enough to turn a bike from something that will give you hearing damage in an hour to something you could ride for 6 hours without damage. They are available from pharmacies, hardware stores and more. Some people prefer the deformable foam ones while others prefer the rubber ones that look like Christmas trees. Make sure that whatever you get will be comfortable under your helmet. If you choose to ride with your visor up then you should always wear a pair of shatterproof sunglasses to protect your eyes. Bear in mind that you should not be riding with sunglasses when visibility is low, though, so a pair of clear goggle or (better) a full face helmet with visor, are your other options. See our guide to riding with glasses. Knee and elbow pads aren't essential, but if you do come off they can cushion the impact, saving you a fracture or break to your knee or elbow. The pads fit under your trousers. Because of the risk of hypothermia in colder regions, base layers should be warm and breathable. As this is the only thing protecting you in an accident, don't buy cheaper, ineffective clothing.